This energizing water is great for taking on the trail or on the way to the gym. For fast infusions, leaving the orange peel intact will result in stronger flavors, so just chop and go! 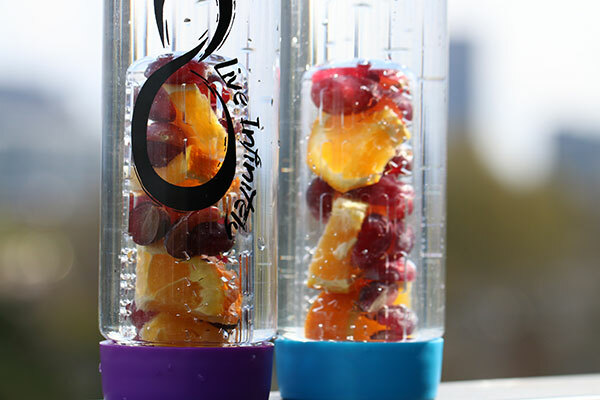 The recipe makes two infuser water bottles of of water, one of which you can keep for the next morning. Divide your fruits for faster infusion. Remove the pointy ends of the orange, then it into 1/4″ – 1/2″ slices. The grapes should be halved, vertically. 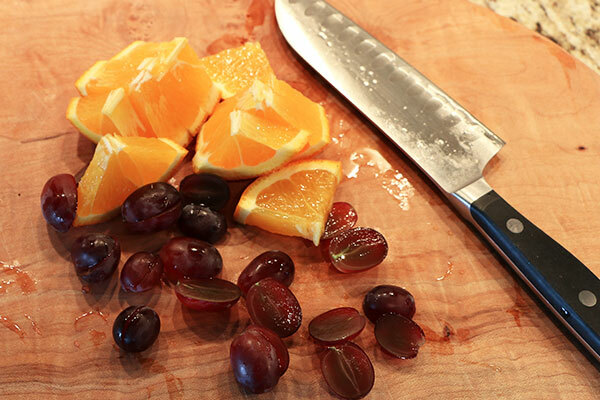 Cutting the fruit should only take you a a few minutes. If you have large or dull knife, I highly recommend the Wustoff Santoko Knife for gettin’ the job done. It’s incredible. Layer the oranges slices and grapes into the bottle’s infusion chamber, then let the water infuse for 30 minutes to 1 hour room at temperature. You can infuse overnight in the fridge, but be sure to remove the fruit in the morning to achieve the best taste. This an interesting concept bottle by Live Infinity. Pick one up for yourself on Amazon! I want to thank you for your very easy to follow steps! I am just beginning this journey. So far I tried cucumber, and it worked great. 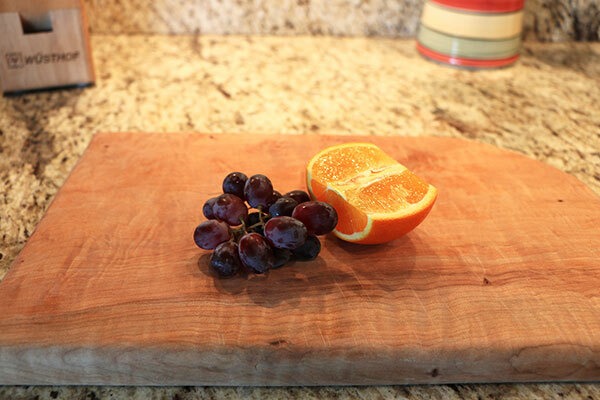 I followed this recipe of grapes and oranges, but unfortunately I didn’t really taste anything! I cut up a fruit exactly like you said and even left it in the fridge overnight. Then removed it the fruit. can you please suggest where I might have gone wrong?? I really appreciate your time! Hi, Leslie. 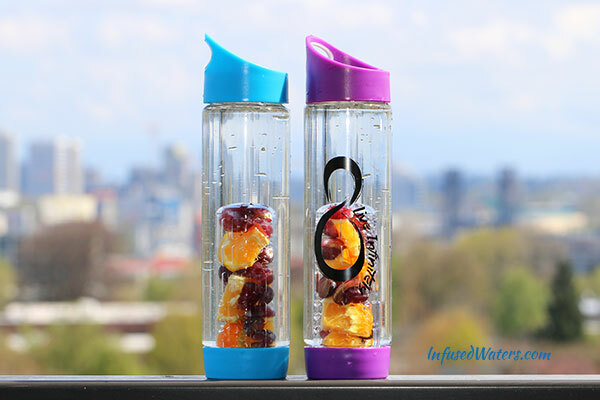 I’ve been doing infused waters this summer, and I found that I prefer to use a little more fruit and infuse for longer. 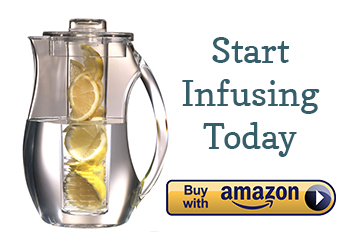 I actually don’t use an infuser bottle – I put my fruit/herbs and ice in a gallon pitcher and fill with water. I strain out what I’m going to drink, and keep re-filling the pitcher. I also stir a couple of times each day (once before I leave for work and once when I get home). The flavor will always be subtle, unless you do a warm infusion (fresh fruit tea!) or add a little squeezed juice to the water. Amy, these combinations look amazing! I just found your site, and I can’t wait to try them. We all know that water is good for us, but it can taste a little bland. Infusing water with fruit is a delicious way to enjoy water, especially since it has all the flavor of fruit without the sugar and calories. It’s especially good over ice on a hot day! I used lemon but it was very bitter . How about orange ?? Should I cut off the citrus ? Meyer lemons might be a bit milder than most citrus, since they’re a cross between a regular lemon and a mandarin orange. Still, it’s best to limit the time on many citrus fruits — especially limes, in my experience. If I’m putting my detox water in a Brita filter water bottle, would that filter the “good stuff” too? Grape and pear is also a very invigorating flavor that I recently discovered! I usually leave the fruit in the water in the refrigerator, gives the water a stronger flavor that lasts.